ELVIS DIED FOR SOMEBODY’S SINS BUT NOT MINE: The Typewriter Is Also A Rock And Roll Instrument – Schlockmania! During his career, Mick Farren has occupied a long string of roles: critic, poet, rocker, commentator, author. His skill as a writer has informed all those roles, allowing him to craft a variety of showcases for his writing skills: albums (both solo and with the Deviants), several non-fiction books, even more novels and countless columns for newspapers, magazines and internet sites. A body of work like that begs for a introductory guide to help the novice plumb its depths – and such a guide has just been created in the form of Elvis Died For Somebody’s Sins But Not Mine, recently released in paperback by Headpress Books. 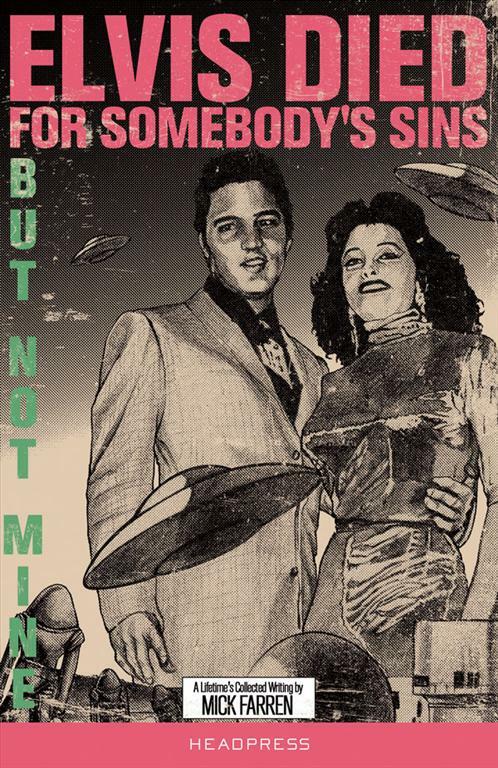 The title should reveal both the irreverent wit and the pop culture obsessions of Farren: Elvis Died For Somebody’s Sins But Not Mine twists an old Patti Smith lyric, replacing Jesus with Elvis Presley – a defining inspiration and frequent writing subject for the author. The collection’s contents offer a rich cross-section of Farren’s work – blogs, poems, chapters from novels, lyrics, news articles, editorials, even unpublished fragments – all orchestrated around themes. Fittingly, Elvis pops up in several of its sections. “A Rock & Roll Insurrection” is the first section and the pieces it show how Farren stumbled into rock journalism while trying to get his own music career going. Alongside pioneering articles on punk, you’ll find some amusing correspondence with Pete Townshend about the meaning of “Won’t Get Fooled Again” and a memorable account of a frustrating interview with a gleefully cryptic Chuck Berry. “From The Barricades To The Bar” revolves around the topics of drugs and drink. Highlights in this area include a scathingly witty guide to cocktails that pokes fun at the motivations of those who drink them and a concise, insightful history of the recreational drugs that have cycled through rock and roll culture. “The Corridors Of Power” presents a tart series of pieces about government and big business, including an interview with Gore Vidal that focuses heavily on abuses of power in the George W. Bush presidency and a thought-provoking piece on a forgotten scandal from the Reagan presidency. The section that gave the book its title follows and it focuses on Elvis as well as other similarly towering presences in popular music. In additional to several articles about Elvis in his final years, there is a sharp interview with Johnny Cash (who reveals himself to be an ace at handling the press) and a piece on Godzilla’s 50th anniversary that finds a witty but surprisingly artful way to compare his career to that of Elvis Presley. The final two sections of the book venture into territory that is as personal as it is imaginative. “Two Thousand Light Years From Home” uses alienation as its major theme and finds it in a broad range of topics, including everything from a pocket history of the paranoia-themed t.v. classic The Prisoner to an absorbing chronicle of UFO cover-ups in U.S. history that has just the right blend of journalistic detachment and narrative flair. The final section is entitled “The Future’s Uncertain And The End Is Always Near.” As the title suggests, it deals with the concept of the end times and mixes journalism about doomsday phenomena like Y2K and the end of the Mayan calendar with several excerpts from Farren’s sci-fi fiction. The best moment in this final section is “Fun In The Final Days,” a brief yet highly detailed short story chronicling a day in the soon-to-end life of an Angeleno as he waits out the collision of another planet with Earth. Despite its Mad Max-ish sci-fi trappings, it’s really an artful rendering of urban alienation that uses its armageddon backdrop to up the dramatic stakes. In short, Elvis Died For Somebody’s Sins But Not Mine is an impressive showcase of Farren’s dexterity as a writer. Despite the diversity of topics and writing styles, the author’s skills never waver. Even in the earliest pieces, he shows a personalized combination of wit, style, honesty and fierce yet artfully deployed intelligence. Whether you’re new to Farren’s work or a veteran, it’s a great little tome to have on your bookshelf. Like quality rock & roll, his material has aged nicely.